Take a look through MECLABS Institute's curated research. 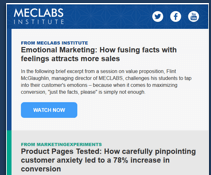 You'll find case studies, success stories and research findings in the format of articles, videos and reports featured here on MECLABS.com. To find additional research conducted by MECLABS subsidiaries over the last 15 years, visit the MarketingSherpa Library and the MarketingExperiments Research Directory.